Tripod mount for attaching your GoPro HD Hero Hero2 Hero 3+ Hero3 hero 4camera to a standard tripod. Thread size: Standard 1/4″ threads. Tripod mount for attaching your Gopro Hero4/3+/3/2/1 to a standard tripod. 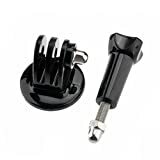 This entry was posted in Discount Photography and tagged Adapter+Thumb, Black, Goliton®, GoPro, Hero4/3+/3/2/1, Mount, Screw, Tripod by Ball Photo. Bookmark the permalink.